Democratic Rep. Keith Ellison (Minn.) on Wednesday called on President Obama to be “firmer and clearer” in pushing Congress to reform a portion of the Voting Rights Act struck down by the Supreme Court in a landmark ruling. WASHINGTON – In the 1780s, the son of a farmer in south-central Pennsylvania purchased from his father 116 acres (47 hectares) where two roads intersected. He laid out 210 lots for a town he named for himself. He was James Gettys. What happened when two armies collided there 150 years ago was, some might argue, not the most important battle in American history or even in the Civil War. The 1777 defeat of the British at Saratoga won French support for the American Revolution. Chief Justice Roberts has proved adept at persuading the court’s more liberal justices to join compromise opinions, allowing him to cite their concessions years later as the basis for closely divided and deeply polarizing conservative victories. In simple terms: If you're accessing the Internet at an Army facility across the country, you would not be able to access parts, if not all, of the website for the British newspaper. "Presidio employees described how they could access the U.S. site, www.guardiannews.com, but were blocked from articles, such as those about the NSA, that redirected to the British site." The Guardian, if you remember, was the first news outlet to publish leaked information about top secret National Security Agency surveillance programs. 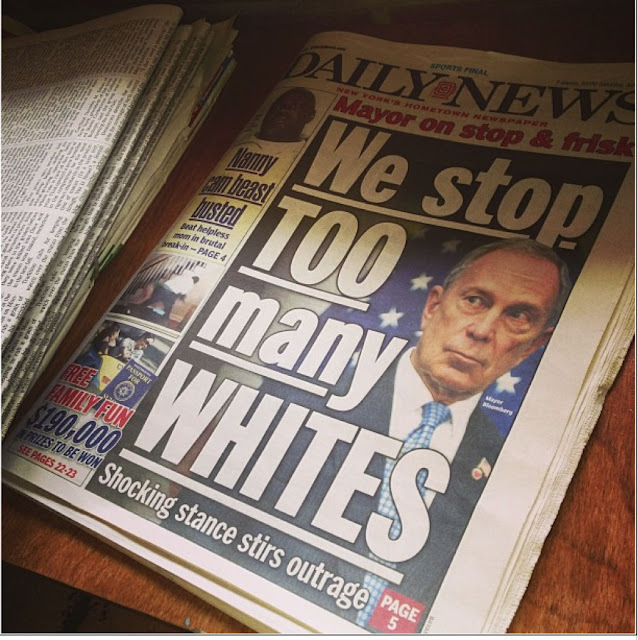 Mayor Bloomberg: NYPD 'Stops Whites Too Much And Minorities Too Little' | ThinkProgress - "“Mayor Bloomberg needs a math lesson. The NYPD’s own data shows that only 11 percent of stops last year were based on suspicion that the individual has committed of a violent crime. More than half of the stops were based on ‘furtive movement’ a catch-all category that encompasses all sorts of innocent behavior. But perhaps the most compelling fact is that since Mayor Bloomberg took office in 2002, nearly 9-10 of more than 5 million police stops were of completely innocent people. That is some truly troubling math." People like Bloomberg need to be heckled and followed wherever they go. Give them peace. Let them know how it feels to be harassed. Anthony Weiner Still Doesn't Know Israel Occupies the West Bank. This guy cannot become Mayor of NYC. Least Action Heroes When it comes to passing borderline meaningless legislation, Congress is the best around. The Supreme Court strikes down a key part of the Voting Rights Act of 1965, and Texas wastes no time in disenfranchising minority voters. The Supreme Court & the Voting Rights Act The Supreme Court strikes down a key part of the Voting Rights Act of 1965, and Texas wastes no time in disenfranchising minority voters. Despite Justice John Roberts’s insistence in the Shelby Voting Rights Act decision that historical perspectives about racism are no longer relevant, the 2012-13 Supreme Court term seems to have been guided by a limited, Jim Crow-era definition of discrimination – concerned only with the formality of legal segregation. This would explain the contrasting support for and evisceration of civil rights across the cases decided this term. That is jaw-dropping. It is an assertion of judicial supremacy over the people’s Representatives in Congress and the Executive. It envisions a Supreme Court standing (or rather enthroned) at the apex of government, empowered to decide all constitutional questions, always and everywhere “primary” in its role. Yet, the Voting Rights Act, which has been in effect continually since 1965 and was re-authorized in a landslide Congressional vote just seven years ago (ten years after DOMA), needed fixing — and it was up to the Supremes to fix it. Keep in mind, Scalia did not write the deciding opinion in the Voting Rights Act case that was handed down on Tuesday (Chief Justice John Roberts did), but he signed on to it, meaning he agrees with it what it says. If he didn't, he could have written his own dissent or a concurring opinion with his own reasoning. Since he publicly acknowledged being the source of bombshell leaks about the NSA two weeks ago, Ed Snowden has portrayed government secrecy as a threat to democracy, and his own leaks as acts of conscience. But chat logs uncovered by the tech news site Ars Technica suggest Snowden hasn’t always felt that way. John Lewis: Supreme Court stabbed civil rights law "in its very heart"
Congressman John Lewis (D-GA), who was a key civil rights leader during the 1960s alongside Martin Luther King, spoke out today about the Supreme Court’s decision in Shelby v. Holder. Shelby, explained in more detail below, gutted a key enforcement provision of the Voting Rights Act, leaving it to Congress to “fix” it. As if the Republicans in the House, or even those in Senate, would lift a finger to help blacks and other minorities ensure their voting rights. Five Supreme Court Justices just rolled back the most effective civil rights provision in our nation's history. What should we do now? One option is to declare "mission accomplished" and forget about race in politics. That, however, will not work. Although we have made amazing progress in the past fifty years, too many state and local politicians still maintain power by manipulating election rules. Nueces County, Texas, provides one example. After the rapidly growing Latino community surpassed 56 percent of its population, the county gerrymandered local election districts to diminish the influence of Latino voters. The Voting Rights Act blocked Nueces County's gerrymandering in 2012, but now that the Court has rolled back the Act, state and local politicians will have more opportunities to manipulate voting rules. Voting rights protections are still needed, and it is feasible to design up-to-date and adequate protections. While today's Supreme Court decision is a setback, Congress has the power to do the right thing and update the Voting Rights Act. Well, I like blaming Apple as much as the next person, but that’s not what’s going on here. Steve Jobs was VERY anti-convergence of desktop and mobile OSes. That’s not to say that he didn’t feel it’d be useful to run apps across devices or synchronize some aspects, but Apple understands that it’s downright stupid to waste all your screen real estate on a singular app when you have such a big screen. So no, Microsoft isn’t following Apple. Microsoft was blinded by a department within them. The Supreme Court has ruled in a 5-4 decision that a key part of the Voting Rights Act—the landmark civil-rights law protecting racial minorities from discrimination at the polls—is unconstitutional in its current form. The decision, announced Monday morning, invalidates—at least for now—Section 5, a crucial tool for fighting racial discrimination in voting, and comes at a time of rising concern over efforts to restrict access to the ballot box. It represents a victory for conservatives, and a blow to the voting rights of millions of non-white Americans. “If the Court struck down or weakened Section 5, it would lead to the largest rollback of American democracy since the end of Reconstruction,” Wade Henderson, the president of the Leadership Conference on Civil and Human Rights, told reporters recently in advance of the ruling. China rebuked the United States on Tuesday for accusing it of facilitating the flight of fugitive US spy agency contractor Edward Snowden, and said suggestions that it had done so were “baseless and unacceptable”. The remarks from the Chinese foreign ministry and earlier comments from state media have underscored the strain in ties between the two countries since Snowden, who is wanted by the US government on charges of espionage, fled Hong Kong on Sunday. Edward Snowden secured a job with a US government contractor for one reason alone - to obtain evidence of Washington's cyberspying networks, the South China Morning Post can reveal. For the first time, Snowden has admitted he sought a position at Booz Allen Hamilton so he could collect proof about the US National Security Agency's secret surveillance programmes ahead of planned leaks to the media. "My position with Booz Allen Hamilton granted me access to lists of machines all over the world the NSA hacked," he told the Post on June 12. "That is why I accepted that position about three months ago." During a live global online chat last week, Snowden also stated he took pay cuts "in the course of pursuing specific work". He said: "Booz was not the most I've been paid." All In : Justice Thomas likens affirmative action support to slavery - Self loathing is a very sad thing. JOHANNESBURG — Nelson Mandela's health has deteriorated and he is now in critical condition, the South African government said Sunday. The office of President Jacob Zuma said in a statement that he had visited the 94-year-old anti-apartheid leader at a hospital Sunday evening and was informed by the medical team that Mandela's condition had become critical in the past 24 hours. "The doctors are doing everything possible to get his condition to improve and are ensuring that Madiba is well-looked after and is comfortable. He is in good hands," Zuma said in the statement, using Mandela's clan name. U.S. asks Hong Kong to extradite PRISM leaker Edward Snowden; Snowden departs Hong Kong for Moscow; a WikiLeaks volunteer had his Gmail account searched; and more. ISTANBUL — IF you look at it from 30,000 feet, what we’re actually dealing with in the Middle East today are the long-delayed consequences of the end of the Ottoman Empire. When the Ottoman Empire collapsed as a result of its defeat in World War I, the colonial powers Britain and France were right there, for their own interests, to impose their own order on the diverse tribes, sects and religions that make up the Arab East. When the British and French left after World War II, they handed power, in many cases, to monarchs, who, in many cases, gave way to generals, who, in all cases, kept their diverse populations in line with iron fists. Wedged into a secure, windowless basement room deep below the Capitol Visitors Center, U.S. District Court Judge John Bates appeared before dozens of senators earlier this month for a highly unusual, top-secret briefing. The lawmakers pressed Bates, according to people familiar with the session, to discuss the inner workings of the United States’ clandestine terrorism surveillance tribunal, which Bates oversaw from 2006 until earlier this year. The most shameful achievement of the House Republican majority has been the elimination of $1.5 trillion in discretionary spending through 2022, which has already held back the economy from substantial growth and done real damage to people and communities that depend on government dollars. The widespread pain caused by this year’s sequester is the best-known aspect of these cuts, but caps that will continue to limit virtually every program for nine more years will also be extremely harmful. Conservatives who think their party can prosper by opposing immigration reform are kidding themselves. The Guardian: UK Spying Scandal Even Bigger Than In U.S.
LONDON — British spies are running an online eavesdropping operation so vast that internal documents say it even outstrips the United States' international Internet surveillance effort, the Guardian newspaper reported Friday. The paper cited British intelligence memos leaked by former National Security Agency contractor Edward Snowden to claim that U.K. spies were tapping into the world's network of fiber optic cables to deliver the "biggest internet access" of any member of the Five Eyes – the name given to the espionage alliance composed of the United States, Britain, Canada, Australia, and New Zealand. Top secret documents submitted to the court that oversees surveillance by US intelligence agencies show the judges have signed off on broad orders which allow the NSA to make use of information "inadvertently" collected from domestic US communications without a warrant. The Guardian is publishing in full two documents submitted to the secret Foreign Intelligence Surveillance Court (known as the Fisa court), signed by Attorney General Eric Holder and stamped 29 July 2009. They detail the procedures the NSA is required to follow to target "non-US persons" under its foreign intelligence powers and what the agency does to minimize data collected on US citizens and residents in the course of that surveillance. As marijuana becomes more accepted --and in some places, legal -- a UCLA researcher has reexamined the question: does smoking marijuana cause lung cancer? In the June edition of Annals of the American Thoracic Society, Donald P. Tashkin, MD, emeritus professor of medicine at UCLA's David Geffen School of Medicine, says that light to moderate marijuana use does not cause increased lung cancer risk and that the verdict is not out on heavy use. WASHINGTON — After contradictory stories emerged about an F.B.I. agent’s killing last month of a Chechen man in Orlando, Fla., who was being questioned over ties to the Boston Marathon bombing suspects, the bureau reassured the public that it would clear up the murky episode. The search giant asks to clear its name by arguing it has the First Amendment right to reveal how many Foreign Intelligence Surveillance Act orders it receives from the U.S. government. Since this conservative Supreme Court has ruled that spending money by corporations is speech than clearly corporations speaking is speeech. Let us see what happens. (CNN) -- James Gandolfini, best known for his role as an anxiety-ridden mob boss on HBO's "The Sopranos," died in Italy, possibly of a heart attack, an HBO spokeswoman and the actor's managers said Wednesday. He was 51. FBI Director Says Agency Is Using Drones Over The U.S.
"FBI hostage negotiators used surveillance drones during a standoff earlier this year with an Alabama man who had taken a boy hostage inside a makeshift underground bunker. "Asked by Sen. Dianne Feinstein (D., Calif.) about what privacy protections are used in deploying drones and storing the images they collect, Mr. Mueller said their use was narrowly focused on specific incidents.
" 'It's very seldom used and generally used in a particular incident when you need the capability,' said Mr. Mueller, who said he wasn't sure what becomes of the images recorded by such drones. 'It is very narrowly focused on particularized cases and particularized needs.' "
All In : Bank of America employee: We were told to lie: ""
The Rachel Maddow Show: Sister Helen Prejean on her influential activism against the death penalty: ""
Supreme Court Rules That Pre-Miranda Silence Can Be Used In Court: ""
JERUSALEM — The intractable Israeli-Palestinian conflict can be seen as a trio of conflicts. There is, of course, the bitter enmity between Israelis and Palestinians, hardened over decades, with many on each side questioning the other’s claim to the land bridging the Jordan River and the Mediterranean Sea. There is the deep rift between the Palestinian Fatah and Hamas factions that many recent reconciliation meetings have failed to resolve. And there is a cleavage within Israel over whether the two-state solution is desirable or even possible. With Secretary of State John Kerry planning his fifth visit here in three months to revive peace talks, the Israeli divide was on stark display last week, as several right-wing ministers in Prime Minister Benjamin Netanyahu’s government professed their profound opposition to a Palestinian state and promised to prevent one. While Mr. Netanyahu distanced himself from the remarks, questions about the sincerity of his recent pleas for peace resurfaced. Clearly, a dissonance exists in Israeli public opinion, where a strong majority supports two states, but only along parameters the Palestinians have roundly rejected. Dore Gold, president of the Jerusalem Center for Public Affairs, said there was a consensus in Israel favoring a Palestinian state, but not along the 1967 borders (as the Palestinian leadership insists); not with East Jerusalem as its capital (a cornerstone of every Palestinian plan); and not without maintaining an Israeli military presence in the Jordan Valley (which Palestinians reject as a challenge to their sovereignty). Israelis have also become more vigilant about security and less trusting of so-called moderate Arab leaders in the wake of the Arab uprisings exploding around them. Dumb, dumb and dumber. Rick Perry is the dumbest politician in America. Can you believe he tried to attack President Obama and could not get his country right. He does not even know the difference between Lebanon and Libya. This Arizona law clearly violated the federal preemption clause of the Constitution. Arizona has become the new Mississippi. Their crooked Sheriff just got slapped by the Federal Courts for racial profiling. What a pathetic group of people who can't stand that Arizona is returning to it's original demographic. Melissa Harris-Perry: Will America see the end of affirmative action? "he final rally of Barack Obama’s 2008 presidential campaign took place on symbolically charged ground: the rolling fields of Manassas, site of the first major battle of the Civil War. It was the last stop on an election eve spent entirely in the South: Jacksonville, Charlotte, and finally Northern Virginia. In the autumn chill, an estimated 90,000 people spread out across the county fairgrounds and waited for hours to cheer a new president—and a new South. By this point, Virginians knew Obama well. In February, he had beaten Hillary Clinton 2 to 1 in the state’s Democratic primary, a blow to her floundering bid. After clinching the nomination, he’d kicked off his general-election campaign in rural Virginia and been a frequent visitor since. Bucking conventional wisdom, Obama’s team had invested heavily in three Southern states: not just perennial battleground Florida but also Virginia and North Carolina, which had not voted Democratic for president since 1964 and 1976, respectively. No Democrat—not even Bill Clinton—had made a serious attempt to win North Carolina or Virginia since Ronald Reagan claimed it in 1980. But Obama was gambling on an emerging South—one that is younger than the rest of the country, far more ethnically diverse than the old black-and-white paradigm, and more liberal-leaning than any Southern generation to precede it. That emerging South was arrayed in the dark hills around Obama as he flashed into the spotlight. On soil where whites once fought to the death for the right to enslave blacks, this throng had gathered to hail the soon-to-be first black man to be elected president. The next day, Obama carried all three of his Southern targets—55 electoral votes for the party. For Southerners, the message was unmistakable: The future has arrived. The Solid South is dead."